Historic Plaster is a Lime-based plaster reinforced with animal hair, usually from horses, cows, goats or oxen. There is a risk, albeit very minor indeed, that animal hair incorporated into plaster mixes before about 1900 (when greater controls were introduced) could be contaminated with anthrax.  Anthrax is a disease of animals that can be transmitted to humans through skin lesions, inhalation or ingestion and causes skin or pulmonary infections. Generally, it is a very rare disease in the UK. Plaster in historic buildings is most likely to be found on walls, ceilings or on infill panels in timber-frames. 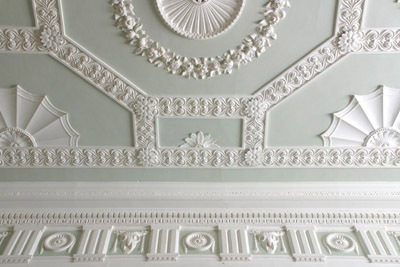 In historic buildings, there is a strong possibility that lime-based plaster has been used, both in original construction and, before the mid-20th century at least, in later repairs. If intact, lime plaster is recognisable by its gentle surface undulation that looks very different from the sheer, flat finish offered by later gypsum plasters. If it is damaged, it can be recognised by the presence of animal hair as a binder in the mix. As mentioned, the risk is very low that anthrax will be contracted from working with historic plaster and no specific treatment is advocated. However, sensible precautions can be taken to minimise the risk further, including: covering any cuts or lesions, washing hands and avoiding hand-to-mouth contact after handling and wearing protective clothing such as gloves and suitable dust masks. 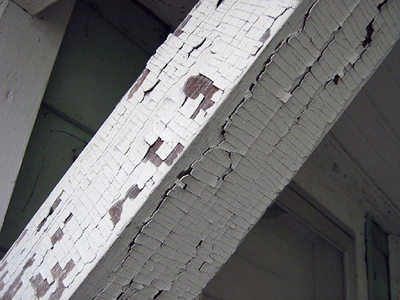 Most of us will be familiar with lead as a heavy metal used building material; its malleability and longevity makes it an excellent material for coverings and flashings. It is a toxic metal and is harmful to health if ingested or inhaled. Lead carbonate and other compounds were used widely in oil-based paints until the 1960s owing to their capacity for improving permeability and elasticity and it is still found widely in historic buildings. Despite being banned from sale in 1992, its controlled use is still permitted for use on Grade I and Grade II* buildings, where alternative materials are not appropriate. In external uses, the risks posed by lead are lower (though present and still requiring suitable management), than when it is found in pipework and paint. Where lead is used in water pipes, or where lead paint has deteriorated or been disturbed, it is possible for people to ingest or inhale lead particles which can lead to lead poisoning of which children are particularly susceptible. When used in water pipes, lead is easily recognisable owing to its dull, grey finish, easily distinguishable from copper or plastic. In paint, it is best to assume that any building constructed before at least 1970 contains some lead paint, perhaps in earlier layers of paint beneath later redecorations. The easiest way to recognise this is by its distinctive pattern of deterioration, which tends to manifest as rectangular cracking, rather than peeling of other paints. The identification can be confirmed by a DIY test kit or by a specialist paint adviser. If lead pipework is carrying water in a building, this should be replaced as soon as possible with copper or plastic. As an interim measure, water filters should be used on any drinking water; a suitable filter should sieve out the lead particles. Asbestos can be found almost anywhere in a historic building, but it is often to be found in places where fire-resistance and/or insulation would normally be required as it’s a material consisting of a group of naturally-occurring, fibrous silicate minerals which is fire-resistant and has good tensile strength and thermal insulating properties. 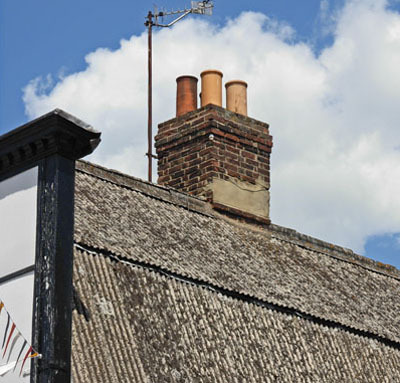 Recognising asbestos around historic buildings can be difficult from visual inspection alone, especially, if it is in good condition and covered with painted coatings. Also, in many cases, it is hidden by fixtures, heaters or plant or hidden away in voids. If it is damaged or broken, its natural dark hue and fibrous inner structure is quite distinctive and can be the best indicator. Often it is this appearance, coupled with the location at which the suspect material is found, that leads one to conclude it is asbestos or asbestos-containing material. In the UK there are three main types – Amosite (‘brown’ asbestos); Crocidolite (‘blue’ asbestos); and Chrysotile (‘white’ asbestos). Despite the awareness of the toxicity of asbestos from the early 20th century the sale of brown and blue asbestos was only banned in the UK in 1985, whilst white asbestos remained technically legal until 1999. In practice, this means that any building built before 2000 may contain asbestos or asbestos-containing materials. The carcinogenic properties of inhaled asbestos fibres are well-known and it is a sad statistic that even now an average of approximately 5,000 people die from asbestos-related diseases in the UK alone each year; in most cases, these are the result of prolonged exposure many decades earlier. In any form where asbestos is a loose material, such as lagging and loose-fill insulation, the risks to health are very high, as floating fibres can be more easily inhaled. If it is in good condition and unbroken, its location within the building and slight visual distinction from later materials, gained from experience alone, would usually be sufficient for an assumed identification. In all cases, if there is doubt then the material should be assumed to be hazardous and works should not be undertaken on or around suspect materials until specialist advice has been sought. It is always our recommendation that owners of domestic historic buildings commission at least an Asbestos Management Survey, formerly known (and still often referred to) as a ‘Type II’ survey, by a specialist contractor, preferably registered with the Asbestos Removal Contractors Association (ARCA); this comprises a visual inspection combined with sampling of suspected materials for laboratory analysis. The resulting report will provide the results of the asbestos samples, as well as their locations and the risks and recommendations for management; this information is not only vital for ensuring the health and safety of homeowners or contractors carrying out maintenance or alterations works on the building, but also provides guidance on how the asbestos can be managed, based on a risk assessment of its asbestos content, condition and likelihood of disturbance. It should be noted that removal of asbestos is likely to require Listed Building Consent and confirmation should always be sought from the Local Authority beforehand. James Weir is an independent building surveyor and architectural historian based in Kent offering a professional, thorough and conscientious service to a wide range of clients, both in the heritage and private sector. Contact the practice on 01634 869222 or visit the website www.jamesweir-hbc.co.uk. This is an article from ProjectBook which provides a wide range of information for the conservation, restoration, care and repair of period and listed buildings. James Weir is a member of the Heritage Register which contains over 500 vetted craftsmen, contractors and consultants from all over the UK. Updated daily with new content, the website features the Heritage Register, a products directory, informative articles, current news, events around the UK and more. For more information, visit www.projectbook.co.uk.